Italians like to talk about wind. Many Italians (the older generation in particular) think that too much air can be unhealthy and can cause mal di gola (a sore throat) or cervicale (cervical syndrome, which affects the neck). I’ve often seen Italians wear scarves in the middle of July, and my Italian-American husband remembers getting colds as a child and having his Italian mother wrap his neck in a handkerchief to help speed up his recovery. I personally love rolling the windows down in nice weather, but I’ve often been out driving with Italian friends and they roll up the window to make sure there’s not too much wind blowing in, asking if the air bothers me. Up until about 10 years ago, many Italians affixed plastic wind guards over the side windows of their cars in order to prevent wind coming in when they rolled down their windows. My husband is an anthropologist and he think this cultural fixation on wind could be a remnant from Greco-Roman times—if you read the Aeneid or the Odyssey, for example, winds are personified as gods who often blew heroes off course, which greatly affected their journeys—and their destinies. While Italians may not believe this anymore, many do think the wind affects one’s health and disposition. I was born in Rome and my American mother remembers Italians talking about the Scirocco wind, a strong Mediterranean wind that flows from the Sahara. Many of her Italian friends noted that it dramatically affected people’s moods, making them angrier or more irritable. My mom even recalls feeling edgier and more out of sorts when this hot, dry wind blew into Rome. She was always happy when it left. Some Italians are particularly sensitive about wind and babies. We visited relatives in southern Italy in early August, and we took a walk outside with our son Alex because there was a nice breeze and we were stifling in the heat of the house. We were told to come back inside—the baby might get too much air or he might get sick! I found this very interesting since the popular American idiom getting “a breath of fresh air” means a change for the better. Of course, Americans are also fond of artificial air and many expect air conditioning when they come to Europe. I have a story about that, but will save it for another post. 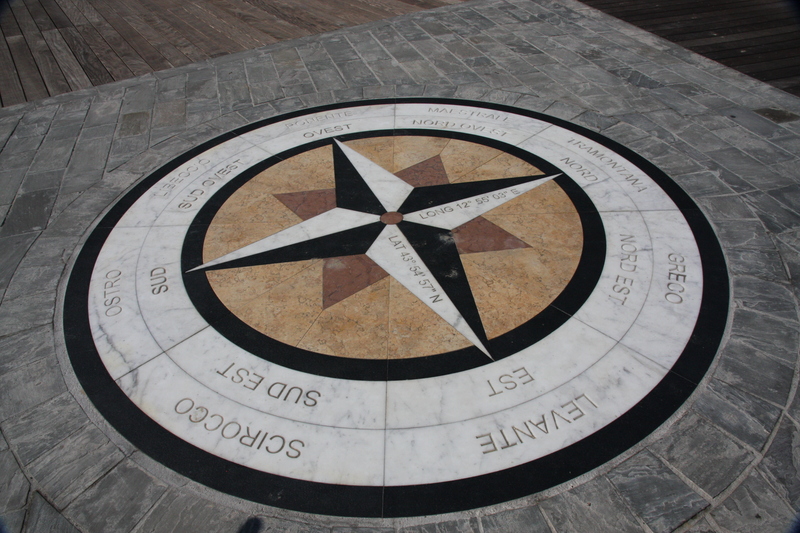 Last year, Pesaro reconstructed their boardwalk and inlaid a marble compass near the pier. Appropriately, it’s an homage to all the different winds and where they originate: the Scirocco (from the Southeast), the Ostro (from the South), the Libeccio (from the Southwest), the Ponente (from the West), the Maestrale (from the Northwest), the Tramontana (from the North), the Greco (from the Northeast) and the Levante (from the East). Now when I walk along the beach, I’ll know exactly which way the wind blows. This entry was posted in American, culture, Italians, Italy and tagged Aeneid, anthropologist, cars, culture, Europe, Italian-American, Italians, Italy, Odyssey, Pesaro, Rome, weather, wind. Bookmark the permalink. I enjoy your posts! I’m from Puerto Rico and I also remember growing up with the same type of thinking about wind. My grandmother never let me play outside if I didn’t protect myself from the wind, even if it was the middle of summer. I believe it’s just what they call old wives tales. This is absolutely intriguing! I’ve never heard of this before. I’ve personally always thought of wind as something wonderful & maybe mysterious…(just think of all the places & people it has seen! )…and this cultural difference is fascinating. I love it! That is a very interesting observation. Indeed, I believe it is a verry mediterranean thing. Turkish people have a similar attitude towards the winds. Even in the middle of August, when it is extremely hot but there is a slightly stronger than usual breze they claim that it is cold now. And most think AC makes you sick… Interestingly Turkey is the setting for many mythological events and perhaps your husband is on to something with his theory. That’s very interesting about Turkey….I’ll share this information with him. Intriguing! Beautiful and intriguing observation! I saw a news story fairly recently regarding transcontinental winds transporting desert dust and thus microbes and bacteria from the Sahara for instance to other continents. I will try to find a link to an article if you are interested. I find it enthralling that at times our habits and superstitions end up being rooted in truth. Microbes or no microbes, my children and I enjoy the feeling of a crisp refreshing breeze, especially on an unseasonably hot afternoon. That’s very interesting–would love to read the article! Thanks for reading the blog! What an interesting image of the wind compass. Great post!